I don’t like sponges being used in clean up situations… I’ve just heard way too much about germs that live up in them. But I do like scrubbies. We had a whole pile of the thing that were given as a gift. It was easy to see that they were little crocheted circles of maroon and hunter green, but I couldnt’ figure out what the material was for the life of me. So one day I’m in the craft store when I see one older lady speaking to another older lady who is putting spool after spool of tulle into her cart. 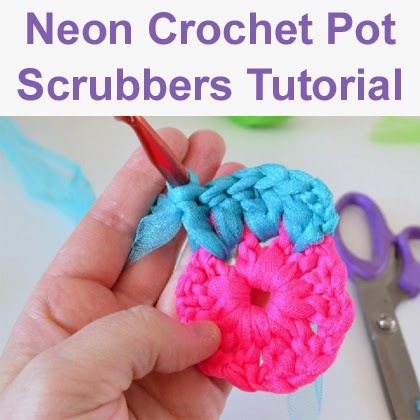 “Are you making tutus?” “No, I’m making little crochet pot scrubbers that my grandaughter sells on the internet for me.” Whoa – crochet pot scrubbers?